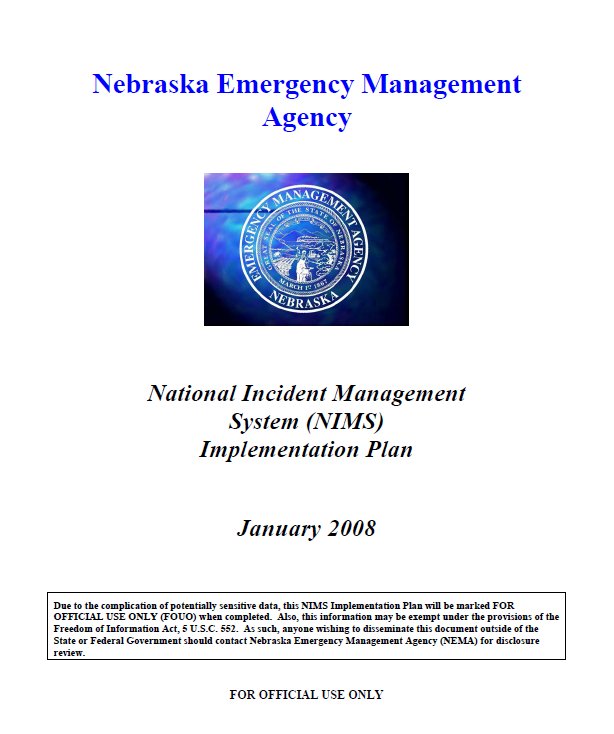 This document establishes the Nebraska Emergency Management Agency’s (NEMA) National Incident Management System (NIMS) Implementation Plan to ensure the State of Nebraska complies with HSPD-5, Management of Domestic Incidents. HSPD-5 requires all State agencies to adopt the NIMS and use it in their individual domestic incident management and emergency prevention, preparedness, response, recovery, and mitigation activities in support of all actions to assist State or local entities. This plan also illustrates the intended methods of incorporation of NIMS into NEMA’s plans, procedures, policies and training programs. Nebraska will adopt NIMS in the following four phases. The first phase will be the development of a Nebraska NIMS Implementation Plan resulting in a plan that will be used by all Homeland Security entities to develop, monitor and maintain their NIMS compliancy plan. This plan will include the responsibilities set forth by the State of Nebraska for any state, local or tribal entity that will receive funds through Homeland Security/NEMA. The second and third phases will be conducted simultaneously. The second phase will include the modification of the State Emergency Operations Plan (SEOP) and the Local Emergency Operations Plan (LEOP) to implement the NIMS standards and the modifications of any existing plans, procedures, and policies to reflect NIMS adoption as outlined in the responsibilities section of this plan. It will be the responsibility of the State, local and tribal agencies to modify their plans, policies and procedures to reflect NIMS. The third phase will be the initial training that Nebraska will require for the adoption of NIMS and the continuation of training in the out-years. The minimum requirements will be the completion of the Basic Incident Command System EMI IS-100, and NIMS independent study course EMI IS-700. Additional training will need to be identified by the separate entities (other state agencies, local and tribal) to meet specific requirements as appropriate. The fourth phase will run in conjunction with the training phase (phase 3). In this phase, it will be the responsibility of each entity (state, local and tribal) to maintain a credentialing of records of their personnel and conduct appropriate validation exercises.